How amazing that you have bats! I love bats! They come and live here every summer and stay in our umbrella on our patio. We feel so blessed to have them with us:) That bat pattern is so sweet and a lovely photo of you! Thanks for sharing your pattern. I do wish you all the best in your new home. EWWWWW Bats are a little scary to me:) but the knitted ones are cool! 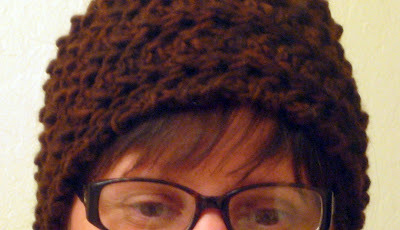 Love the scarf and it looks really warm! Enjoy your Friday my friend! BIG HUGS! 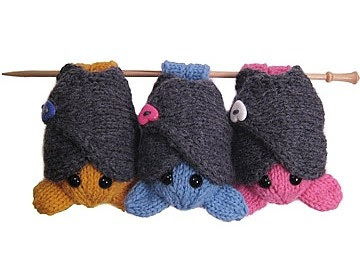 The bats (knitted) are adorable! The real things - very interesting! We had them in our shutters and in our deck umbrella one year. I id'd the droppings. Thankfully, none are living that close now. But at dusk and dawn you can see them flying about. I have never seen Malabrigo in person but so want to try knitting w/it. Beautiful scarf!!! Love the color and the texture! Aren't bats the cutest!?! I love them! Oh my god I love those bats!!! Those bats are adorable! Wish the real ones were. How cute - who would have thought bats could be cute at all? I don't know if it's the iPad or what, but your photo shows the top of your head and your glasses. So...either the rest of the picture was cut off, or you're modeling a scarf around your head. I'm going back to have another look. I admire people who love bats. I know they are really good for the ecosystem but they gross me out. About 8 years ago, I had bats inside my house -- as a single mom! No guy to take care of the problem! I'm still traumatized! The scarf is adorable. I definitely want to do one! Those bats are stinkin cute!!! Can't wait to see yours. Ha! It's a Wilson pose! The hat looks great. I'm not sure how I feel about bats though. They're pretty cool, but not when they're in your house! Those are the cutest bats I've ever seen. I had an artist friend that loves bats and we did an exchange...so I made her a copper 'bat' pin. I made a bat mask, too, out of screening but I painted it very 'un' bat like, because I am really afraid of bats. But I'm not afraid of yours, they're just too cute!